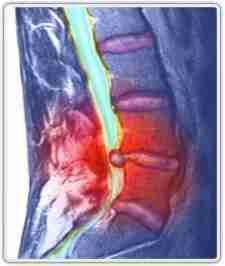 Help for sciatica pain is at hand with chiropractic help. Help for sciatica pain is certainly relevant. With about 20% of folk having it at least once in a lifetime, and 5% of people having an attack of sciatica every year, sciatica cures abound. None work all the time. But internet users like to google "sciatica pain" so sciatica pain it is. The consumer is always right! The sciatic nerve is the largest nerve in the body; it's as thick as your finger and runs from the lower back to the foot. Before thinking about how to cure sciatica you should understand first what it is, otherwise, if you don't do the right exercises, the miserable affliction will start all over again next week. There are other rare sources such as tumors, but they really are like hen's teeth. If you have loss of bladder control, weight loss, cancer elsewhere, well, yes, the other causes of sciatica leg pain must be considered. 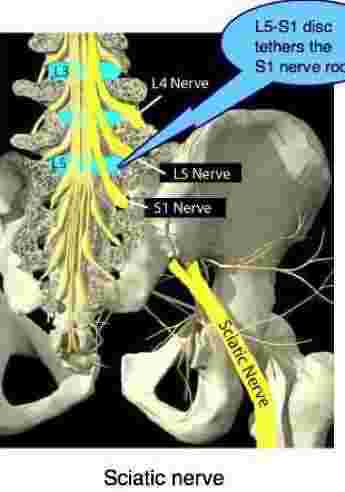 The sciatic nerve is made up primarily of three nerve roots located at the very bottom of the spine: primarily the so called lumbar 4, lumbar 5 and sacral 1 roots. They travel down the spine in what is called the horse's tail and then escape via a foramen. This foramen, it's full name is an inter vertebral foramen, is a narrow tunnel between the vertebrae which enables the nerve root to escape from the spinal canal on it's way to the leg. 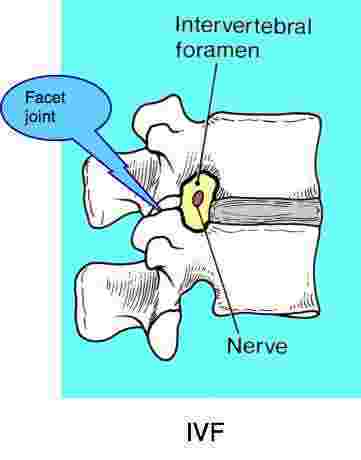 On each side of the spine a "intervertebral foramen" or IVF, or just "foramen" is located at each spinal level, strategically and vulnerably placed right between a facet joint and the disc joint. Both can be causes of sciatica by interfering with the nerve roots. HOW DO THEY INTERFERE WITH THE NERVE ROOTS? Both the facets and the vertebral end plates are made of hyaline cartilage, one of the tissues in the body that has no blood supply. They are supplied with nutrients and oxygen, and waste products removed, by fluid in and around the joints. HYALINE CARTILAGE ... If either the disc of the facet joints are fixated, the synovial fluids in the joints are not adequately refreshed causing a build up of waste products. This toxic soup of wastes is now known to be one of the causes of sciatica. One's first thought should be of prevention before sciatica cures. From Chiropractic Tips you can get some very basic lumbar exercises. We all sit too much, our core muscles become weak and a few simple exercises done faithfully every day will do wonders for sciatica back pain treatment. Think Immobilisation arthritis prevention and sciatica stretches before sciatica nerve treatment! How to cure sciatica? Frankly, a "cure" doesn't exist. Once you've had a bad attack of sciatica, no matter what help for sciatic pain you seek, it will remain a vulnerable part of your body. Exercise, exercise, exercise... is your best bet. And accept that lifting pianos and the like is not for you. Your chiropractor will start with a posture examination. Do you have the sign of Pisa - look like a question mark? Do you have a short leg, what is known in Chiropractic jargon as a Leg Length Inequality? LEG LENGTH INEQUALITY ... Effective help for sciatic pain is dependent on a proper diagnosis of the level. Next your Chiropractor will be looking for "hard neurological signs". Can you stand on your heel, raising your big toe, can you go up and down several times on your toes, taking your full weight on one foot? Then the reflexes and tests for numbness or increased sensation in the skin. It's all quite involved and gives precise information as to which nerve root is affected. Sometimes it can be more than one level causing considerable scratching of the head! That's where a MR scan is so useful. Motion palpation, a technique developed by Belgian chiropractor Henri Gillet, is an important part of the chiropractic examination. Your chiropractor will carefully examine your spine and pelvis looking for fixated joints. It's a difficult procedure; more of an art than a science perhaps, and requires a long time to perfect. After nearly thirty five years I'm still learning. It's an absolutely vital part of my protocol, because my sciatica back pain treatment is based on these motion palpation findings. Why is that, you may well ask? 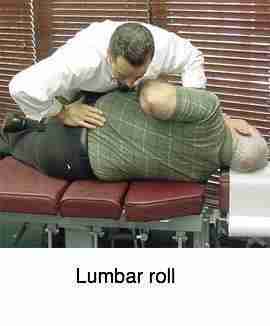 Let's consider the lumbo sacral disc at the base of the spine. Traditionally, it's considered this bottom most joint will pinch the first sacral nerve root. That's because the herniation is usually central. However if the disc extrudes laterally into the foramen, then it will pinch the nerve root above, the fifth lumbar, and confuse the examining doctor; the pain will radiate to the big toe area. If you can't raise your big toe then he or she is likely to think it's not the bottom most disc, but one higher. If he's luckily enough to have a scan then all is revealed. However this is not normally the case; MRIs are very expensive. It's motion palpation that helps your chiropractor decide which level he should be adjusting. Adjust the wrong vertebra and it just won't get better. Here is where there is considerable variation depending on your condition, and your Chiropractor's preferred treatment protocol. One chiropractor might prefer using a Thompson drop treatment (my first choice), another frank manipulation, an activator, SOT pelvic blocks, McManus traction... all of these have their place, one perhaps more suited to your condition that another. Lower back exercises are vital to properly rehabilitate the injured joint, and strengthen the core muscles; they also help prevent you from joining that group of five percent who will have an episode every year and eventually progress to surgery. Your chiropractor can provide help for sciatica pain, but you have to help yourself too. In all honesty, I cannot guarantee it and, in fact, I think it's unlikely that lower back exercises can fix a sciatica. But they will do wonders to prevent the next bout of pain once your chiropractor has reduced the pressure on the nerve. 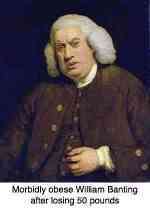 There's no harm in trying them to see if you can get relief, though; perhaps for a maximum of a week or two. Then, say to yourself, in all honesty, is this improving? If not, well, you know what to do. It's time to get help for sciatica pain. If you get pain in the leg, or it's very tight in the thigh with forward bending then do the disc exercises on YouTube. If you get pain in the leg whilst bending backwards then do the facet exercises. However, this is not always true; an extruded disc into the foramen will also give pain on extension. Be guided by your doctor who has the responsibility of making the diagnosis. If you are having lateral thigh pain, then Noble's test helps to exclude an ilio tibial band syndrome. In short, exercise is more for preventing the next episode than curing you of this one. I am particularly in doubt about the merits of sciatica stretches; if the nerve is tethered and you stretch it, further damage is likely. Go from help for sciatica pain to Severe pain in lower left leg.